My name is Maciej Kopciuch and I`m an artist craftsman from Poland. My specialisation are medieval swords 10-15th century. I`m also a painter, sculptor, music composer, writer. Interested in medieval Arts, martial arts and crafts. My approach to swords reconstruction is to be as close as possible to this what I can see in museums. I think that the real, original swords give us the greatest amount of information and guidance for work. I`m not trying to make “better' swords than medieval – but real swords, which have specific character for the period and craftsman. All hand made things and artworks have in themselves dose of creator personality. Things produced mechanically don`t have it. 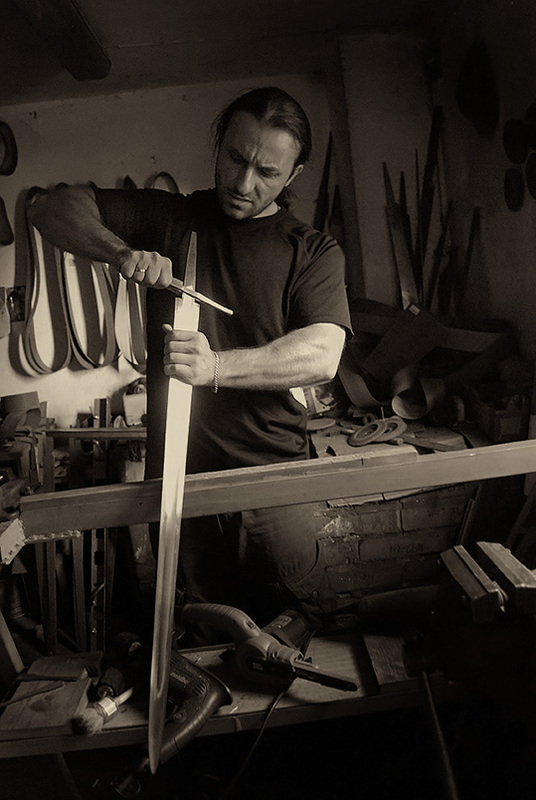 Many craftsmen today trying to make swords best ever quality and sometimes forget about original medieval pieces – stop to pay more attention on them - but focus only on their colleagues works – and this kind of competition is not good in the long term. We should also realize that there were many of craftsmen in Middle Ages, but all of their works were made not for exposition – but as a weapon. This is an art – but we can not forget that we are talking about true weapon. Most of the swords were not made for admiring them - but for battle. We should start from this point and when we will understand – the general approach will change. Then we will see that all details are designed for this purpose, all features are the result of preparing this thing to protect the owner, to be safe for user and deadly for his enemies. Only then we can talk about the technology, proportions, cross-sections, parameters – also about the types. In the time of war – nobody is thinking about the decorations. We call sometimes the inscriptions on the blades unfairly as “decorations' - but they were made for protection – not decoration – mostly as religious invocations, prayers, signs. It is hard to understand today – that why it needs a special approach and knowledge about Middle Ages.